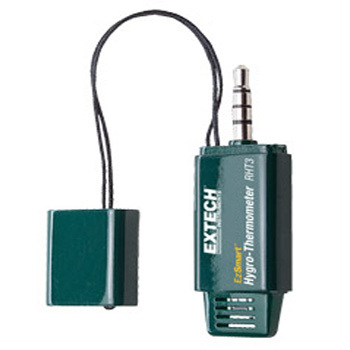 Extech RHT3- EzSmart™ Hygro-Thermometer – Infinity HVAC Spares & Tools Pvt. Ltd.
Free app from iTunes® and Google Play™ for taking readings and further analysis. Measures Humidity and Temperature simultaneously. Calculates Wet Bulb and Dew Point Temperature. Continuous graph plots Humidity and Temperature changes over time. 5 user-settable high/low alarms for both Temperature and Humidity. 4 records – each contains 100 data points with Humidity, Temperature, Wet Bulb, and Dew Point, plus Time, Date and GPS coordinates. Post images directly to social media (Facebook® and Twitter™). Complete with built-in sensor and protective connector cap with strap.